On March 1st 2018, the installation of the Fire Sirens was completed for Loch Lomond, Cobb, Anderson Springs, and Middletown. The Lake County Sheriff’s Department with Cal OES will be conducting tests for the Sirens in the near future. The Sheriff’s Department and Cal OES will be notifying the public of dates and times testing will be conducted. “We have reached our goal and now the fire sirens have been installed. I would like to thank everyone that contributed to this project including, Middletown Rancheria, Calpine, Anderson Springs Community Alliance, Anderson Springs Community Service District, The Volunteer Fire Fighter Association, The Fire Sirens Auxiliary Group, and other community members. With their support, the fire siren project has been fully funded and the fire sirens have been installed.” said Battalion Chief Mike Wink. The Middletown Rancheria of Pomo Indians and Calpine Corporation raised and donated a combined total of over $100,000 for the South Lake County Fire Protection District (SLCFPD) to be used for the purchase and installation of Emergency Public Notification Sirens in South Lake County area. 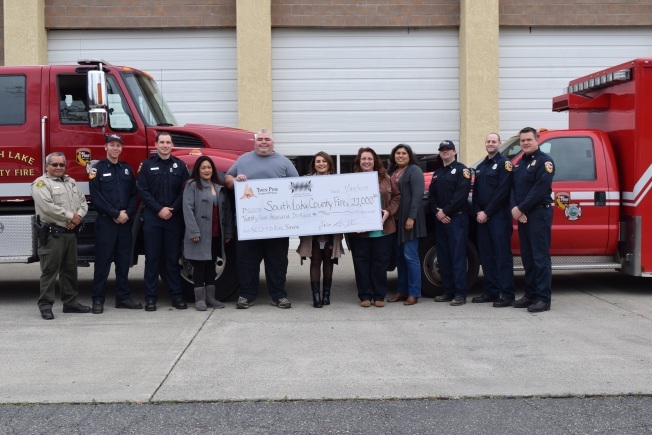 The most recent donation of $22,000 on January 29th 2018 from the Middletown Rancheria was the final amount needed to fully fund the Fire Sirens Project. In late 2016, the South Lake County Fire Protection District (SLCFPD) with the support of the Lake County Fire Chiefs Association, and the Lake County Sheriff’s Office/County Office of Emergency Services proposed the purchase and installation of Emergency Public Notification Sirens in South Lake County area. Following the Valley Fire in September 2015, the public made it clear that they want an early notification system to provide another layer of emergency notification from the Lake County Sheriff’s Office/County Office of Emergency Services in South County. The SLCFPD public notification sirens will be controlled by the Sheriff’s Office Dispatch Center to alert people there is an emergency and they need to seek additional information from radio, NIXLE, City Watch, Reverse 911, social media. The sirens will be controlled by a radio frequency signal that will activate the individual sirens as needed. This will facilitate activating one siren at a time, or all of the sirens can be activated as needed. Originally, the SLCFPD considered utilizing existing sirens that are still in place but not used. Following a careful look at newer technology such as sirens around nuclear sites and tsunami warning sirens, it was obvious that newer technology sirens were needed to increase the notification areas of the fire district. The sirens will be placed to provide intended coverage to areas zoned as “R-1 Single Family Residential”, and “R-R Rural Residential” of the fire district. While no system will provide coverage to every citizen, the placement determination has been based on historical use and zoning information provided by Lake County GIS (Geospatial Information Systems) to provide the maximum community notification. With a comprehensive estimate in hand, SLCFPD sought funding from the community for this important project. Calpine Corporation, at the recommendation of the Cobb Valley Community Investment Committees fully funded the Cobb and Loch Lomond sirens at $45,000 with installation planned onsite at the fire stations in those communities. Calpine, with the support of the Anderson Springs Community Investment Committee additionally provided $21,700 in funding and has agreed to house the siren at its warehouse site near the community. “Calpine is honored to be a part of the South Lake County community and appreciative of the efforts of everyone involved in making this project a reality” said Danielle Matthews Seperas, Calpine’s Manager of Community Affairs. “Calpine and the community are also very grateful to Northern California Power Agency (NCPA) for their funding support”. NCPA contributed $7,000 in funding toward the Anderson Springs community’s siren purchase. In March of 2017, Middletown Rancheria donated $10,000 to SLCFPD. The most recent donation of $22,000 brings the total donation toward the Fire Sirens to $32,000 from the Tribe. Now that the sirens have been installed, they will be under control of the Lake County Sheriff’s Department for testing and activation. This Community Notification Siren will alert people an emergency in their area as determined by the Lake County Sheriff’s Department. It will be activated when the Sheriff’s Department declares an emergency and with maintenance and testing coordinated by the South Lake County Fire Protection District in cooperation with the Lake County Sheriff’s Department. All donations and contributions were held in trust by the SLCFPD until the project was fully funded from multiple entities, organizations, foundations, Valley Fire groups, Utility Companies, Home Owner Associations, private donors and political leaders.